SKU: DS-L.WDS.DCGG. Categories: LADIES GLOVES, Women's Deerskin Gloves, Women's Gauntlet Gloves. 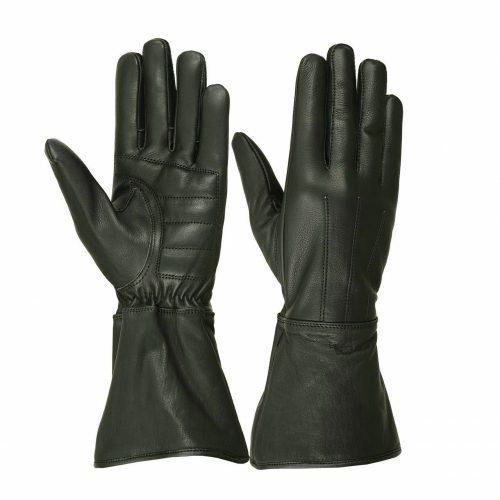 These Ladies water resistant deerskin gauntlet gloves feature extra soft and supple leather. The extra long cuff keeps wind and rain out of sleeves. The padded palm absorbs road vibrations and creates a more comfortable grip. The elasticized wrist provides a secure fit. These gloves are unlined; it may be necessary to order one size smaller. Why water resistant leather? We understand the importance of comfort while traveling through weather changes. Having the right pair of gloves can make or break the enjoyment of your ride. 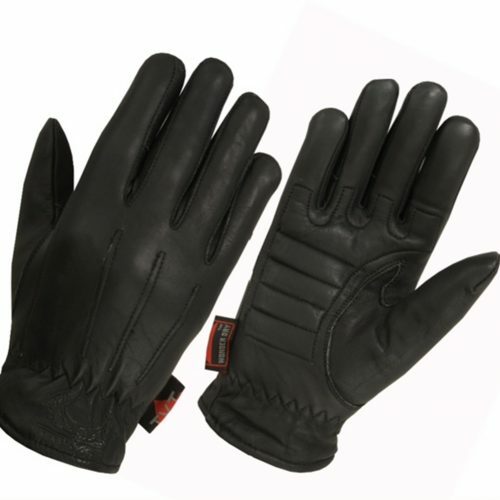 Our line of leather products will keep your hands warm and dry and allow you to better maintain control of your bike. Have any questions? Fill out our contact form here. These gloves are soft and very comfortable, fit well, and don’t have too thick an interior lining, so they don’t feel too hot. They’re almost perfect… almost. I specifically chose them because I was looking for a pair of gloves that would work for a costume I’m trying to put together, and I needed something without a visible logo, but the pair I received has a big (2 inches across) embossed logo square in the middle of the cuff where everyone is going to see it. So yeah… one of the main details that led me to buy these gloves (the lack of a visible logo) is actually not true for this product. I’m still giving this four stars because I know this review reflects on the manufacturer just as much as it does on Amazon, if not more. From the standpoint of someone who wants gloves to wear on an everyday basis, these are perfect. From the standpoint of someone who really needed logo-less gloves for a costume project, these simply do not work, and that is a shame because everything else about them is really great. At first I thought they were too big, but then appreciated the fact that I could wear my glove liners with them for extra warmth when needed. The gauntlet cuffs keep the wind from blowing up my jacket sleeves. IT IS A CHRISTMAS GIFT SO I WILL HAVE TO WAIT UNTIL AFTER THAT TO DO A BETTER REVIEW. My wife thinks they are fantastic!!! She loves them. Get 10% off with coupon code Spring10 now through 4/2. 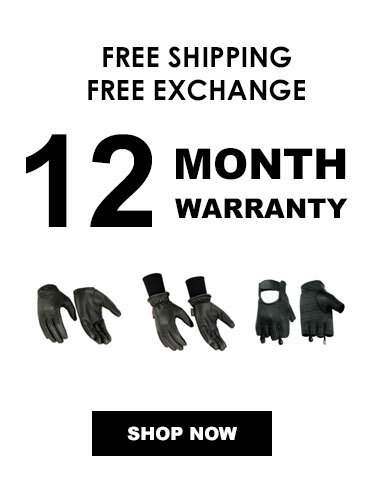 Close out – Men’s Comfort Zone Fingerless Glove now just $19.94. Join our email list and get a 10% off coupon code. Hugger Gloves are the most comfortable & durable gloves available. The best biker accessory; be sure to have a pair on hand for your next motorcycle ride.